In the 1990’s, I had a client gig that I knew was going to be a challenging one. Their director had spent 3 years strategically building consensus that they should have a consensus-building workshop! So I decided that I needed to think through some ground rules to start with. Now I have always hated ground rules. They generally come to me as “thou shalt not”s, all negative energy about what you shouldn’t do. So I created something that at first I called “Ground Rules”. And then I realized that they were presuppositions — assumptions that I was making and expected the group to make in order to work together productively. But who wants a 5-syllable word at the top of a flipchart to start the day? So I named them “Working Assumptions”. I have used them every since with most groups. I write a cryptic form of them on a flipchart (in bold below) and talk through a description of them with the group (in parentheses). I have never had a group reject these working assumptions altogether. Someone in the first group, however, did differ with the 3rd one. As soon as I said “There are no wrong answers”, a lady at the back of the room pounded on the table and shouted “There are too wrong answers!” And I thought really, really fast and replied, “And that’s not a wrong answer either!” Everybody laughed. “There are sometimes wrong answers on the surface, but it is the wisdom under them that we are listening for.” The group had a great retreat and listened to each other for maybe the first time in their history. For number 4, “The whole is greater than the sum of its parts,” I have had various people try to make this more clear. Tim, one of my Cree trainees said, “You know, it’s like a band. Each instrument — the guitar, the bass, the drums — makes a good sound on its own. But when you put them together, the music they create is greater than any one of them could come up with on their own.” I’ve used his analogy ever since and get lots of nods of understanding. 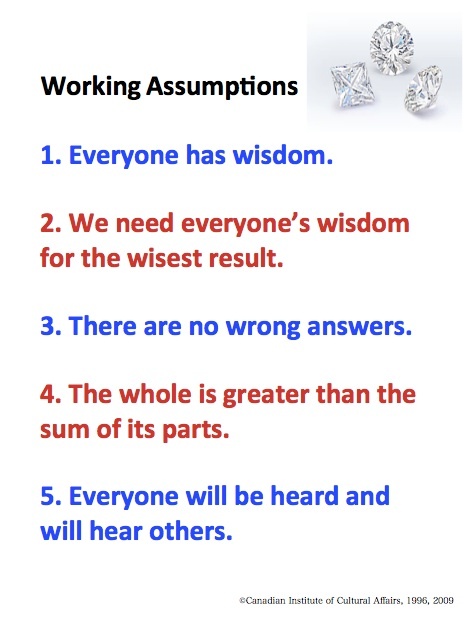 I’ve attached a link to the PowerPoint poster of the Working Assumptions.